Our copper diamond shingles make the ultimate statement on any roof, combining distinction, beauty and unparalleled performance. The Old World design of our copper diamond shingles is perfectly complemented by the elegance and durability of copper, particularly as it develops a custom patina. Our copper diamond shingle is offered in standard sizes of 10 or 16 inch, as well as our custom Harlequin profile, a stretched diamond measuring 13 x 18 inches. Additional custom sizes are available as required by the unique site conditions of specific projects. Still investigating copper? 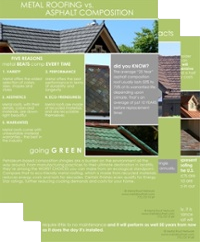 Get your FREE copy of our Copper Roof Facts & Details Sheet now!